Great educational tool for kids. An interactive and affordable fact finder for all the family. Double-sided with a rotating inner disc. 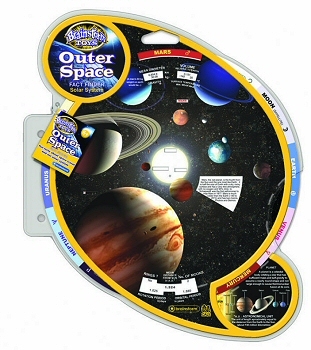 The front contains twelve facts about the main objects in our Solar System including: size, surface temperature, rotation period and orbit plus a full description giving the important features of each object. The reverse details 20 key moments in the history of space travel, from the launch of Sputnik in 1957, through the moon landings and the Space Shuttle programme, right up to the SpaceShipOne spaceplane. This portable fact finder comes in a handy 29 cm diameter perspex case. A wonderful resource for the school classroom.